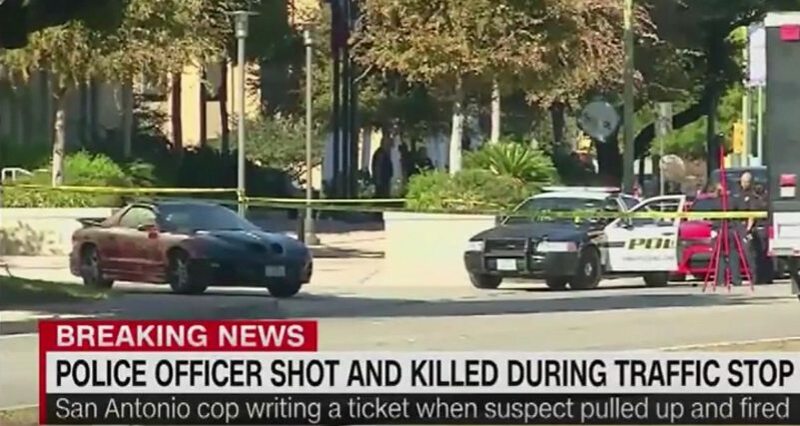 Breaking News: A black male shot a San Antonio police officer, with 20 years of public service, execution style, while the officer was sitting in his patrol car writing up a traffic ticket outside the San Antonio police Headquarters on Sunday. The man, in a black car, pulled up behind Detective Benjamin Marconi, 50, got out of his car and walked up to the passenger side window and shot Marconi in the head. Then, the suspect reached into the window and shot him a second time in the head. The suspect, who fled the scene, has been described as a black male wearing a hoodie and baggy pants. He also has a beard and is approximately 5’7 and the motive is unclear. In response, Texas Governor Greg Abbott, and U.S. Sen. Ted Cruz (R-Texas) issued statements of this senseless killing as the assaults and murders of police officers around the nation continue.